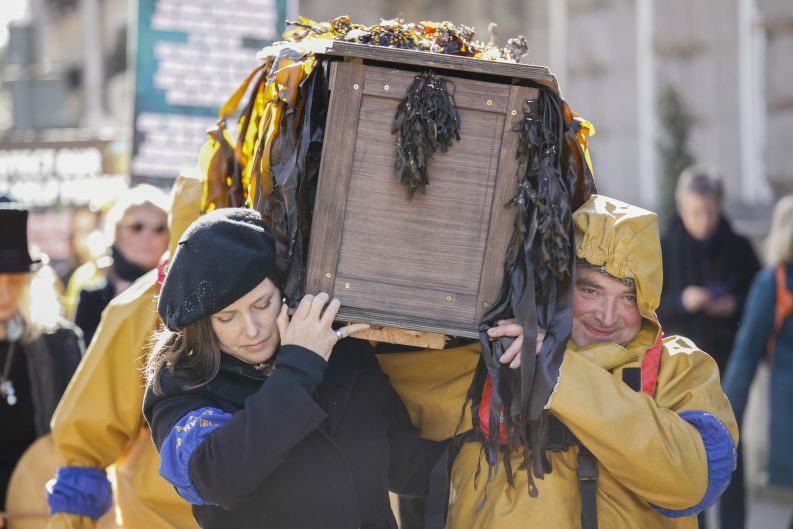 A campaign group held a mock funeral procession for Ireland’s seaweed outside the Dail yesterday in protest against the granting of a large-scale mechanical harvesting license in Bantry Bay. 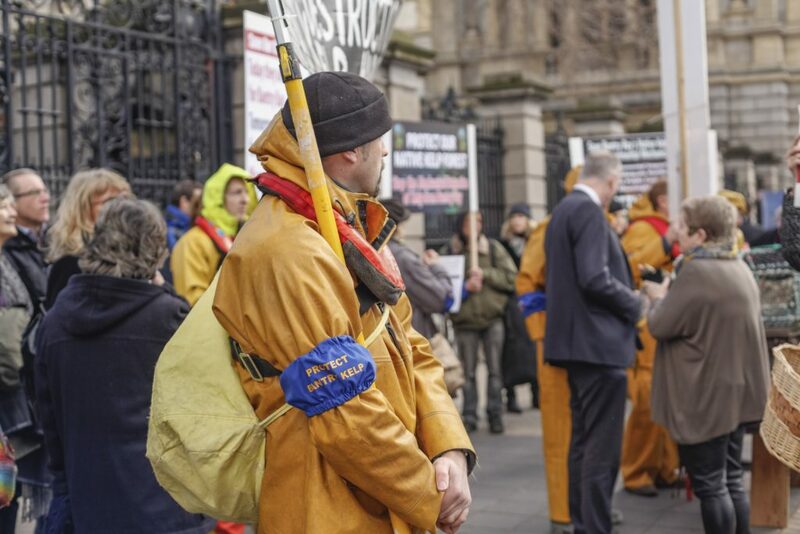 The demonstration coincided that the launch of a Private Member’s Motion to tackle a lack of regulation and monitoring of the seaweed sector. The Bantry Bay group was formed after locals became aware of the granting of a licence to Tralee-based biotechnology company BioAtlantis to mechanically harvest 1,800 acres along the Beara and Sheep’s Head peninsulas. It is set to be the largest kelp harvesting operation on the island of Ireland. The group, however, argue that BioAtlantis’ plans would cause “untold damage” to the environment, marine life, the fishing industry and tourism in their area. 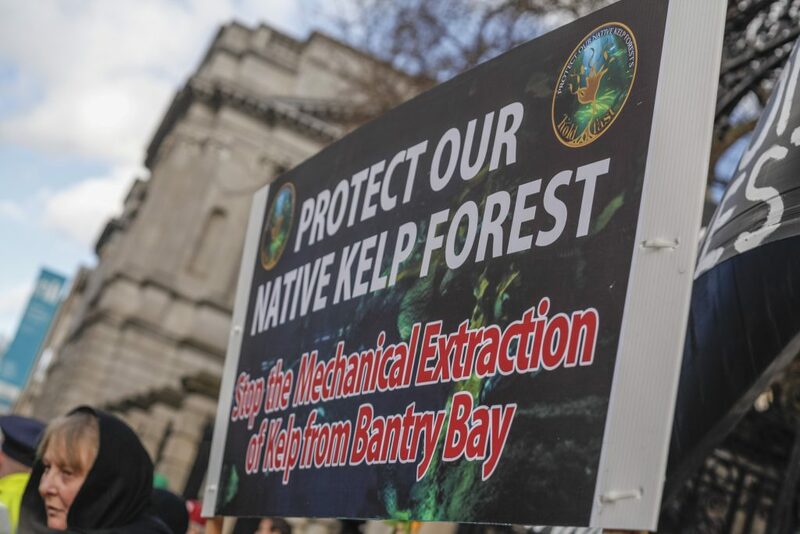 Emily Shakespeare, a spokesperson for the group, said that the licence was issued without an Environmental Impact Assessment and that the communities around Bantry Bay were not properly consulted. The group said that there was inadequate advertising for the license and that no public meetings were held to inform the residents of Bantry Bay about the proposed project. According to the group, most locals only found out about the license application when it featured on an episode of RTE’s EcoEye in February 2017. BioAtlantis originally applied for the license in 2009. “The people of West Cork had no idea about the plans and are deeply worried about our livelihoods and our local environment,” Ms Shakespeare added. 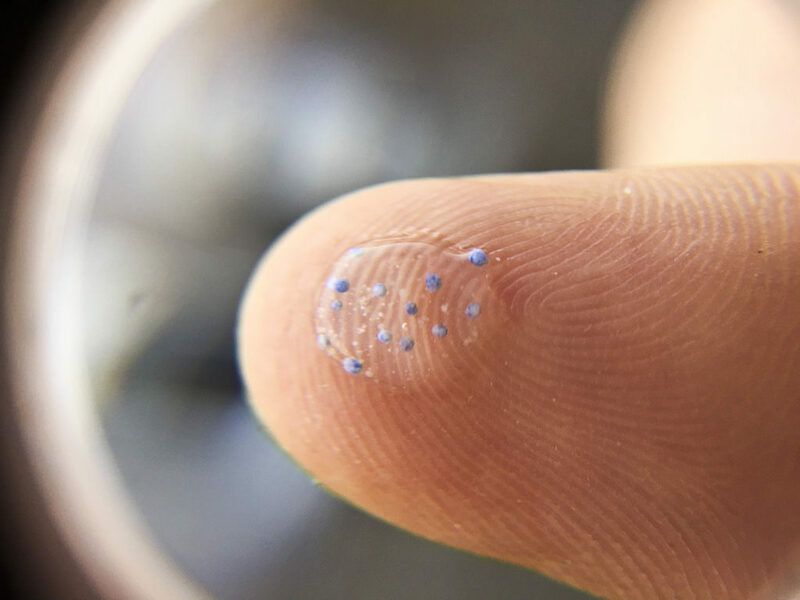 BioAtlantis CEO, John O’Sullivan has previously refuted these claims, telling The Green News that fears over the impact on the marine ecosystem are unfounded as the harvest area would correspond to just 0.3 per cent of the total bay area. Mr O’Sullivan said that the application was advertised in the Southern Star and details of the application and maps were provided in Bantry Garda Station in accordance with the 1933 Foreshore Act. Mr O’Sullivan added that the project does not require an EIA as kelp harvesting does not fall under Annexes I and II the EIA Directive, as outlined in a statement by the European Commissioner for Maritime Affairs, Karmenu Vella last September. Mr Vella said that any plan likely to have a significant effect on these sites is subject to an appropriate assessment of its implications on the site conservation objectives as laid out in the Habitats Directive. A Motion brought by independent deputies Catherine Connolly and Thomas Pringle is calling on the Government to publish a national strategy to promote the development of the seaweed sector in Ireland which takes into account the interests of traditional seaweed harvesters. The TDs are also calling a suspension of the granting of new licences until a national strategy is published and to ensure that the new license regime favours traditional harvesters and protects their rights from commercial interests. The Motion would looks for responsibility for licencing of seaweed to be moved to the Department of the Marine (DAFM) as recommended in a 2015 report from the Joint Committee on the Environment. A vote on the Bill is set to be held in the Dail this afternoon. Fianna Fail, Sinn Fein, the Green Party, and the People Before Profit Alliance are set to support the Bill. Seaweed harvesting has been a traditional occupation in many coastal areas and is a primary source of income for many communities in Gaeltacht areas in counties Galway, Mayo and Donegal. Almost 40,000 tonnes of seaweed is harvested manually in Ireland each year, over 95 per cent of which is naturally grown. Irish seaweed is mainly used for high volume, low-value products such as animal feeds and plant supplements. Just one per cent is used in higher value products such as foods and cosmetics and therapies but generates 30 per cent of the industry’s overall value. The National University of Ireland Galway estimates that the value of the sector to be €18 million per annum, €6 million of which goes on exports.